Police: Suspects made withdrawals with stolen bank card | Crime Stoppers of the Lowcountry: 554-1111 | 1-888-CRIME-SC | Anonymous tips earn cash rewards with Crime Stoppers of the Lowcountry. SUMMERVILLE, SC (WCSC) - Summerville police are searching for two suspects who they say stole a woman's purse and used her debit card to made fraudulent withdrawals. Police say the suspects broke into a car that was in the Saw Branch Trail parking lot on Wednesday, June 27 around 2 p.m. When the victim returned to her car, officials say her side window was forced open and her purse was missing. Ten minutes later, fraudulent withdrawals were being made on the victim's First Federal account. Police say the suspects were able to make the withdrawals using the victim's driver's license and bank account information. Reports say the suspects received money from First Federal locations in Summerville, Charleston, North Charleston, and Goose Creek. A surveillance camera spotted the suspects driving a silver Nissan Quest van during all four incidents. The suspect driving the vehicle is a white male who has a light beard and is approximately 30 to 35-years-old. The other suspect in the vehicle is a white female with dark color hair and is approximately 25 to 35-years-old. 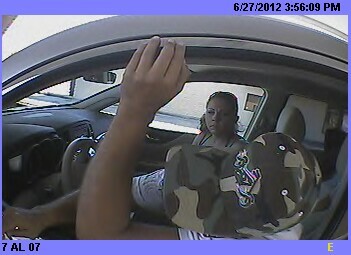 If you can help identify the suspects, contact the Summerville Police Department at 843-285-7027.